Our elegant aluminium frames are available in two distinctive finishes. Choose from anodized polished silver or a clean white powder coated finish. All enclosures, doors and screen heights are measured from the top of the tray or bath. Smart and practical bow handles in matching stainless steel or white are generally fitted to all semi-frameless enclosures. Towel rails are supplied where specified. Our high quality extension profiles can be used to bridge gaps in non-standard sized openings. All our doors are fitted with an easy glide mechanism and full height magnetic water seals to provide positive closing. All sliding doors in the semi-frameless range feature roller bearings and clips, which are adjustable to allow for fine tuning of door alignment and clip out to allow for easy cleaning. 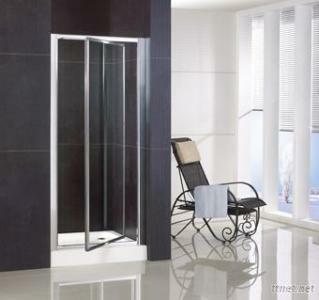 Bracing arms provide additional support, strength and safety for all double panel bath screens and our elegant Compartment, Walk In and Shower Screen enclosures. Himalaya has been investing large capital and resources on the advanced management system since the establishment in 2003. We are now one of the biggest OEM suppliers in China. At himalaya, every shower enclosure, door and bath screen in our range comes with the invisible protection of double-side easy-clean nano coating - at free of charge.